Boil potatoes, peel skin, make small slit with knife and keep it aside. Take carrots, add 1 cup of water and mix it in the mixture and make a gravy. Take a pan and heat oil. Add cinnamon, cloves, ginger, stir it for 2-3 times. 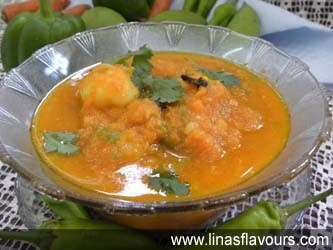 Add carrot gravy, salt, green chillies, fresh cream, coconut powder, lemon zest, cinnamon-clove powder and mix it well. Add 1 cup of water and let it boil. Add boiled potatoes and let it simmer on medium flame for about 7-8 minutes. If you feel, it is too dry, you can add more water. It depends upon the consistency of gravy you want. Garnish it with coriander leaves and serve it hot with roti or paratha.